What else can one see in my city, beside SWAT teams (with dogs, thank you) on the subway? How about a monk in robes AND freshly shaved AND spray-tanned calves in the same ten feet?! How about this gorgeous picture my boss purchased in London? It had been crated up in our office for months and I finally sent it down the block to the framer and had it done up in double mats and museum glass and a gorgeous frame. It's breathtaking in real life and I was only a little ashamed to admit that I had never had anything professionally framed before. It cost a king's ransom too, which may have had something to do with my inexperience. 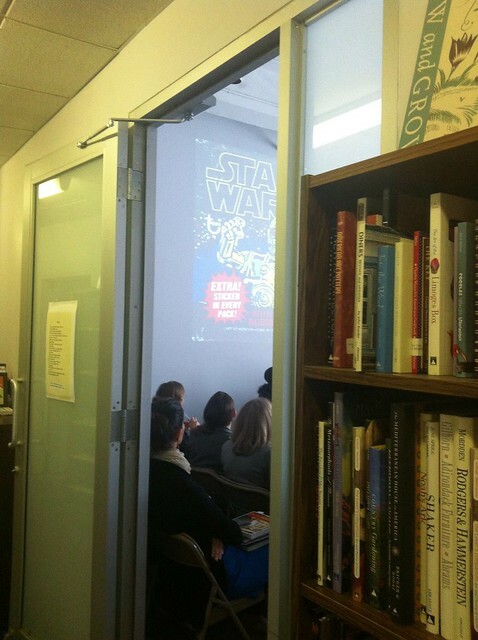 A new Star Wars project was announced at my office this week. I know four boys who will be very excited when it is finished. I've been playing Word Jewels on my phone, on the train. Can you see SUSE? And SHAWL? Lots of points for those words, played this evening. BUT ALSO: Suse has sent me two (TWO!) exquisite shawls and I am in heaven. It is still cool enough in the morning to wear them and, after the air conditioning freezes us in the office, will be cool enough to wear them in the office. They are GORGEOUS and I'll get you photos ASAP. I play word games all the time on my iPod and iPad -- must seek out this one. Also, I look forward to seeing the shawls. Hand-knit, I assume? Or not, either wasy. Lovely! I have seen some of Suse's knitting in person and it is truly wonderful so I can imagine that those shawls are delightful. And the painting your boss bought? Gorgeous. PS Yeoman was my wv and it reminds me a little of Sarah Yeoman watercolour. Weird. EXTRA! STICKER IN EVERY PACK of what????? Inquiring mind wants to know. By the way, I'd settle for cool in the mornings. It has been snowing here, ALL DAY LONG! Liking the painting, don't tell me you went to Michaels again! Always try the mom & pop shops first. Oh the things you can see in your city ... that one is indeed a nice pairing. I am hooked on word games too, don't know this one but found word chums where I play against chumbots ... love it!